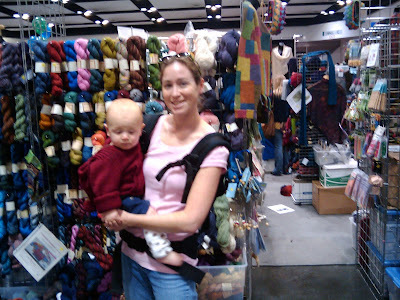 Today, our family went to Stitches West 2009 at the Santa Clara Convention Center. This is an expo for all things yarn and knitting (with some crochet). Andrew and Blake got roped into going with me to this extravaganza. 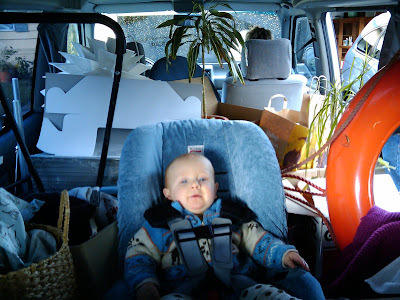 First off, here is a photo from when we moved. The Stitches West photos were taken with Andrew's cell phone because we forgot the camera. This happened to be in his phone when I was uploading the pics to post here. Poor Blake squished in the Eurovan with all our junk. So what does one wear to a knitting convention? A hand knit item of course. Blake is wearing the sweater that Sandy, Andrew's sister, made for him. He is slowly growing into it and it is the softest thing you have ever felt. Thanks Aunt Sandy. 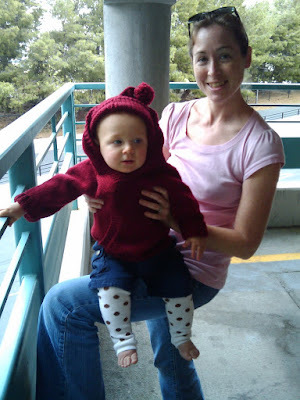 The Baby Legs are leg warmers for babies that Grammie so nicely provided Blake with. Not hand made, but super fun. Here we are enjoying some wool. 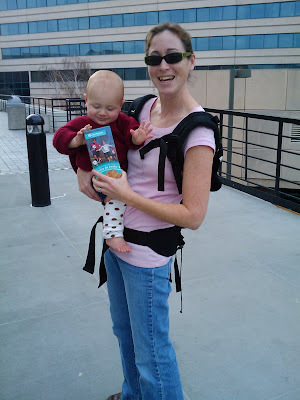 I wore my Beco baby carrier so Blake could enjoy all the yarn and the chest strap snapped two minutes into the show. I carried him around for the first half of the marketplace and then had Andrew carry him the last half. Jeesh, I pay a fortune for the thing and it lets me down when I need it the most. Andrew said we could have fixed it on the spot if only we were at a sewer's convention. Darn knitters with their huge needles. So what does one buy at a knitter's convention? Um, Girl Scout Cookies of course. The only thing I purchased at the show were three boxes of GS cookies. We had to try the new flavor this year (Dulce de Leche) and to our dismay they weren't very good. Stitches West 2009 was a dissappointment and I don't think I will be going back every year. Maybe it will get better if I take some classes, but I have enough unfinished and yet-to-be started projects in the pipeline. Hey! Sorry I didn't get to see you guys yesterday. I agree about Stitches this year - not so impressed. That's why Mary and I left early. I was planning on going today, but I don't think I'll go. I got a couple things, but nothing I'm super crazy about.